Only 6 more days until Christmas Eve! 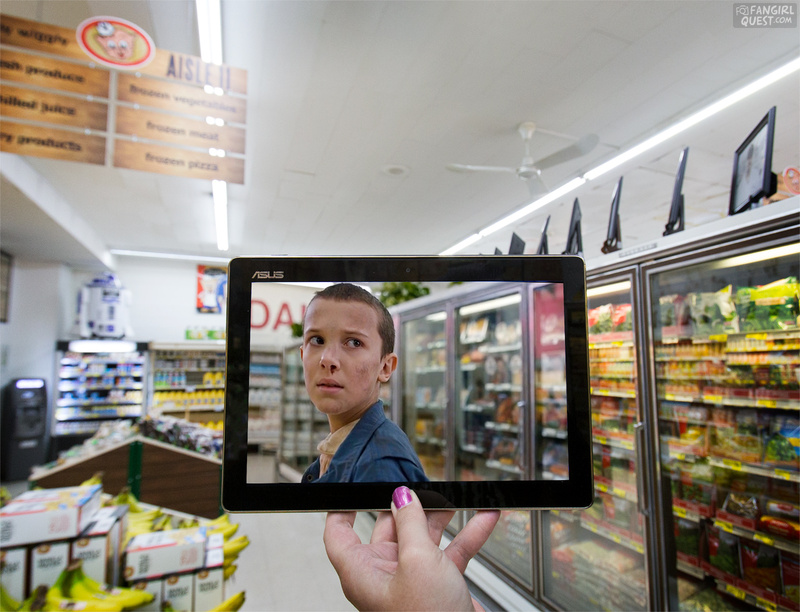 We’re counting down the days ’til Christmas with a new sceneframe every day on social media. Here’s the third instalment of our advent calendar blog posts. Make sure to check out also parts one and two! On December 13th we celebrate St. Lucy’s Day in Finland. A young girl is crowned with a wreath adorned with candles and celebrated as the “beacon of brightness” in the darkest time of year. Here at Fangirl Quest, when someone says “Lucy” we can’t help but think of Lucifer. Sure, he’s no saint but the character certainly brings light to our dark days. 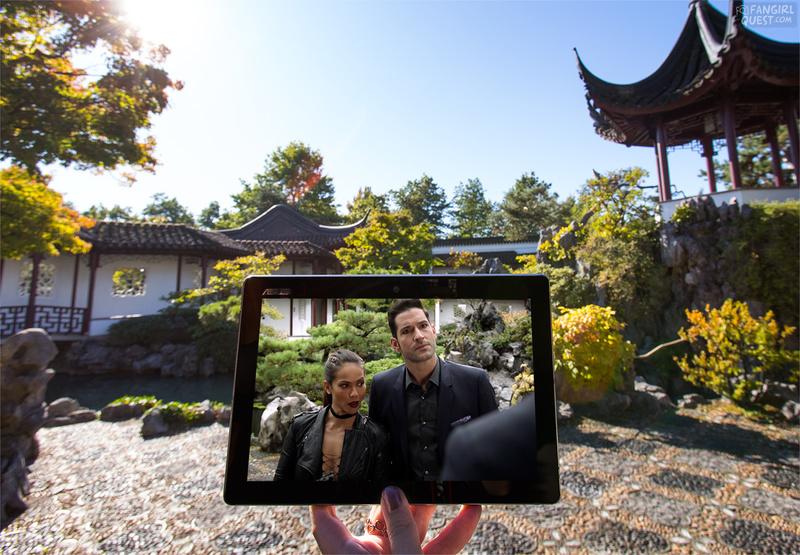 Dr. Sun Yat-Sen Classical Chinese Garden in the heart of Chinatown in Vancouver set the the stage for some awesome fight scenes in the show’s second season. 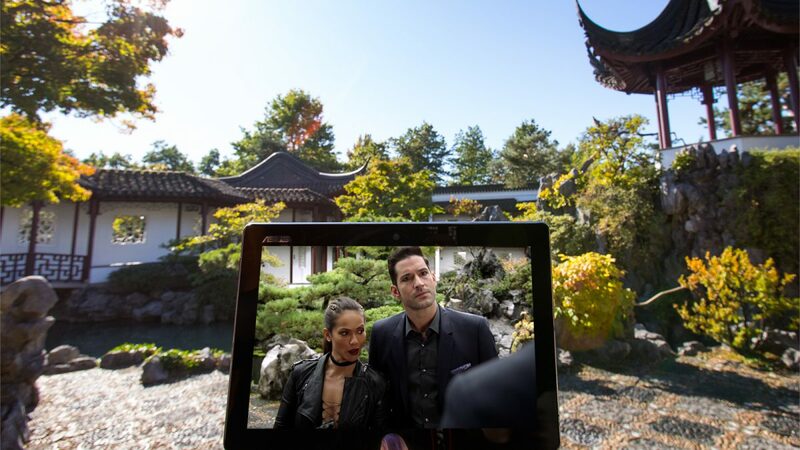 It’s a beautiful and serene place for a relaxed stroll even you’re not a fan of Mr. Morningstar. Albert Dock in Liverpool is a lovely tourist area. There’s The Beatles Story and loads of fun little shops and restaurants and even a maritime museum. It’s also where we took this shot from Captain America: The First Avenger. 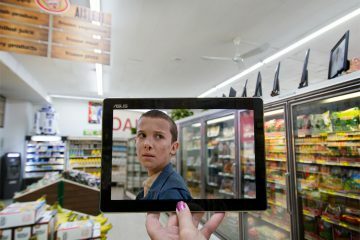 Fun fact: it’s not actually filmed there, as we later found out. There are several of these docks along the Mersey River and they all look a lot alike. 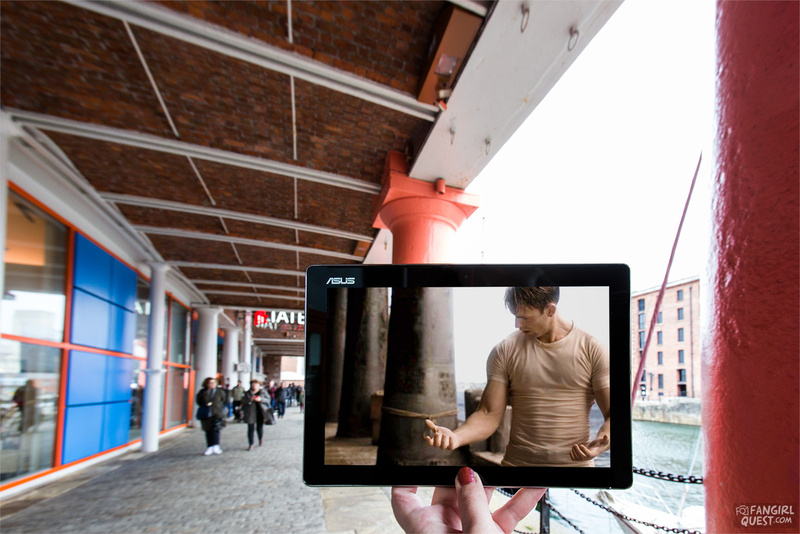 The actual filming location for the movie is a little bit north from where we were at Stanley Dock. It’s currently under construction and sadly will no longer look anything like it does in the movie once it’s done. Luckily we still have Albert Dock! When the Parks and Rec crew visited London, Andy made friends with Lord Edgar Covington and they played with remote control helicopters in the yard of his lavish residence. The grandiose house is actually the Horse Guards Building just a short walk from Buckingham Palace. There’s also a museum inside as well as the mandatory gift shop. 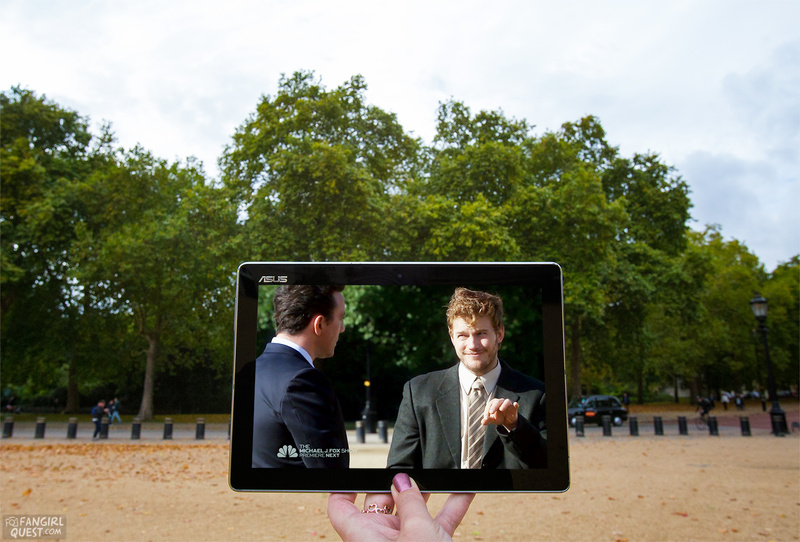 The park behind Andy is St James’ Park which is lovely for a leisurely stroll. The park has also been home to a flock of pelicans for nearly 400 years! St George’s Hall in Liverpool was built in the 19th century as a venue for festivals, meetings, dinners and concerts. To this day it serves that purpose, but is also a popular filming location, thanks to its large halls and neo-Grecian architecture. This scene from Fantastic Beasts was filmed in the great hall but there are several other spaces in the building as well. 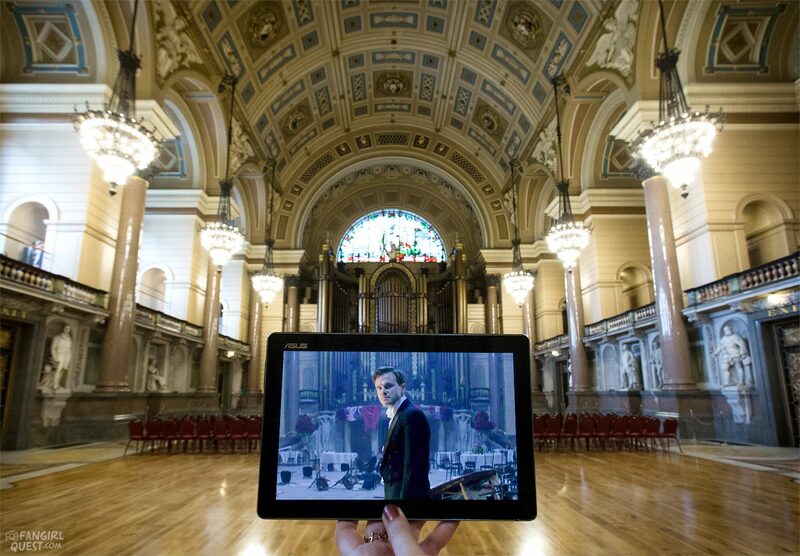 Other productions that have filmed here include Peaky Blinders and the movie In the Name of the Father. 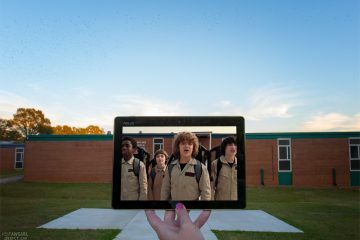 Another Stranger Things location but this time southeast of Atlanta in Stockbridge, GA.
One of the most iconic shots from the new season of Stranger Things was the guys in their Ghostbusters Halloween costumes in front of Hawkins Middle School. 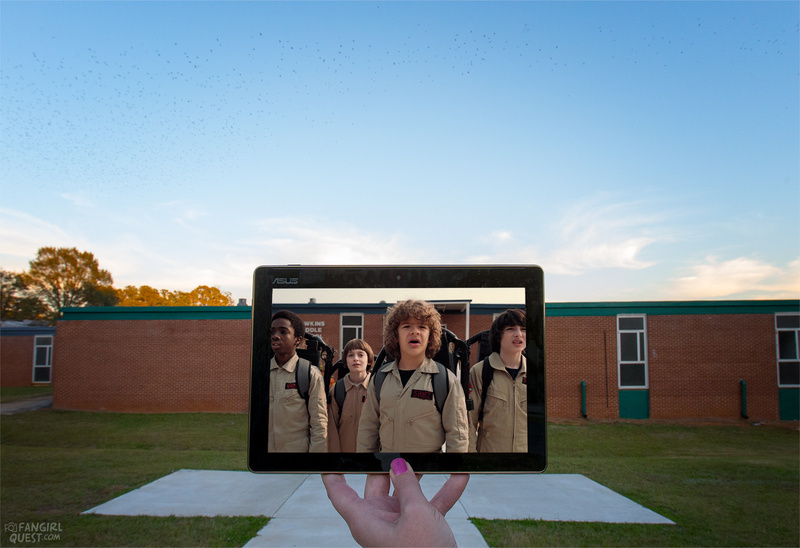 That and all the other scenes at the school were actually filmed at Stockbridge High School. It served as both Hawkins High School and Middle School, thanks to the sprawling campus. One of the best things to come out of the four connected superhero shows on the CW are the crossover episodes. This one is from last year’s Invasion. It’s from The Flash episode, but features a host of characters from all shows. The location is a familiar one if you’re a fan of The Flash. 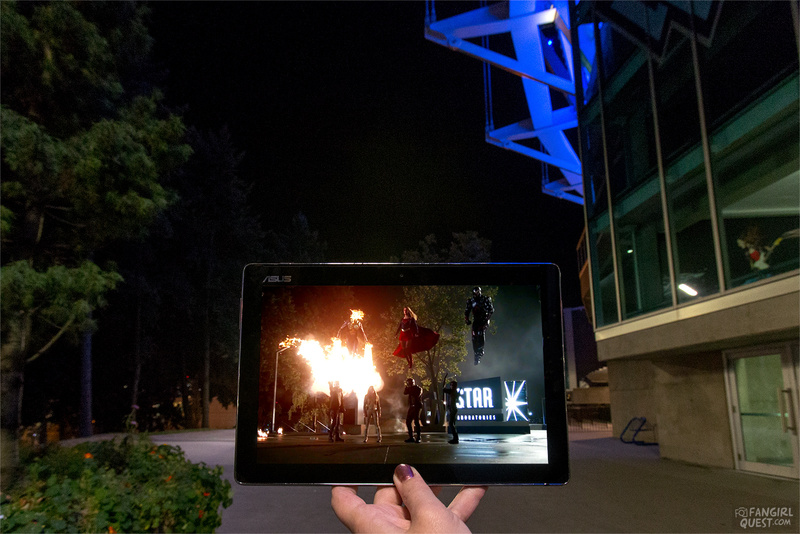 BC Place Stadium is used for all exterior shots of S.T.A.R. Labs and has been seen on the show multiple times. In real life, it hosts sporting events and live music shows. It’s also a very noticeable landmark on the southside of downtown Vancouver! Follow our advent calendar on Instagram to be the first to see new sceneframes!